The IPRS-section and the Organization Committee for the 52nd INTERSTENO congress 2019 in Cagliari welcome all interested parliamentary and other reporters to a pre-congress visit to the Italian Senate and some historical buildings related to the Senate in Rome on Thursday, 11 July 2019, 12.00 h.
It's an excellent opportunity to combine a stop in the stunning Italian capital of Rome with the congress in Cagliari. From Rome you can easily find a flight to Cagliari on Friday. The building hosting the Italian Senate is called Palazzo Madama. It dates back to the 15th century, it is a magnificent example of Renaissance art, and has a long story to tell. For example, did you know that the hemicycle gathering MPs during plenary sessions was formerly occupied by stables? To have an idea of what you are going to visit, you can make a virtual tour here: www.senato.it/vt/vtall. Intersteno visitors will also have the opportunity to follow a part of the ongoing parliamentary session and to visit the reporting offices, who will present their activity at the end of the guided tour. Please notice that, to enter the Senate, a dress code is to be respected: jacket and tie for men and nothing specific for women. However, it is warmly suggested to avoid beach-like style such as wearing flip flops, miniskirts, tank tops and the like. The visit is free of charge and will end at about 16.00 h.
Access is only possible with a valid ID-Card or Passport! 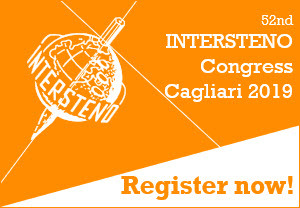 And you must be registered to attend the INTERSTENO congress in Cagliari to join the Senate visit. You can register now for the Senate visit with the form you find below. The number of visitors is limited. Please fill out the form very carefully: correct official names and correct Passport or ID number must still be valid on 11 July 2019! Registration for the congress in Cagliari will be open in early 2019. From Civitavecchia station to port there is a 10 minutes walk or taxi. At 09.00 h on July 12 passengers will be in Cagliari. The cost for the ferry is 78 EUR (seat only), 128 EUR (double room used as single room) or 178 EUR (double room). On Friday, there is at this moment a Ryanair flight at 08.00 h from Rome Ciampino airport to Cagliari (09.20 h). There are other flights (last one at 20.30 h). To go to Rome Ciampino airport from Rome Termini station, Terravision bus (5.80 EUR) at 06.30 (40 minutes). Most probably other flights will be scheduled by other operators (Alitalia...) in the next months. It could be worth waiting these offers.